With the encouragement of Practical Farmers of Iowa, we will be having a field class on Wednesday afternoon from 1:00 -4:00 pm. Agroforestry class listens to Tom Wahl near pawpaw grove. opportunity to sample some of the non-traditional crops featured throughout the day. (515) 232-5661 by Monday, September 3. 1:30 Group lead by Kathy Dice learns about chestnuts. 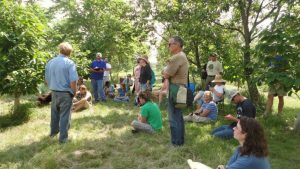 See a field guide of other Practical Farmers of Iowa events at https://www.practicalfarmers.org/wp-content/uploads/2018/05/2018-Field-Day-Guide_web.pdf .